Regular readers will know that packet foods are not my normal thing, but that I DO believe in 'convenience foods' such as Ella's Kitchen, just so long as the ingredients aren't alien and the nutritional contents don't read like a horror story. There are occasions during a busy working week, or a frantic weekend when I do just need to grab something quick from the cupboard to cook a meal for just Lara, not the family. 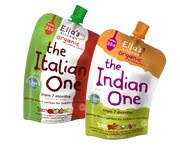 When Lara was younger, we tried a couple of Ella's Kitchen organic pouches but I didn't 'get' the pouch thing and despite the flavours sounding a bit wacky, I found them all to smell a bit miserable. Recently, I've been trying out some of the range of Ella's Kitchen stage 3 and toddler foods with mixed results. The Pack 'o' Snacks seemed like a great idea, especially when Lara was at the childminder and I was looking for ideas for lunchbox snacks. 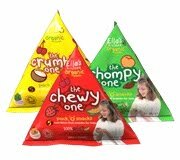 They are cute, brightly-coloured pyramids that contain little pieces of organic dried fruit. The trouble with toddlers is that they don't sit still long enough to hold a little bag (pyramid or no pyramid) so I end up tipping the contents into a pot more likely to withstand the challenge of a mobile toddler; this immediately makes these snacks less convenient than I'd thought. I also find that Lara struggles with the very tiny pieces; a raisin is about as small as her little fingers can reasonably manage and so she leaves the smaller bits and pieces. 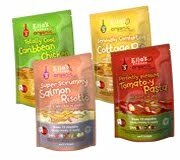 We tried a couple of the Ella's Kitchen Stage 3 pouches which are a bit bigger than their other pouch products. The ingredients all sound great – no nasties or unidentifiable chemicals anywhere. But, upon opening, heating and serving, I was still very disappointed. The contents were sloppy and looked like the texture of food I would have fed Lara at about 8 months old. Both the sachets we tried smelled a bit... processed. Packet food just has this smell that repulses me and Lara wasn't much more impressed than I was. We were much more impressed with the 'Has-to-be-Pasta' and 'Nice-Rice' which come in boxes containing a few single servings making them incredibly convenient when I need to knock up a Lara-only meal. Paired with one of the Ella's Kitchen cook-in sauces (The Italian One or The Indian One) and a few crunchy vegetables, I can fashion an acceptable meal for Lara in minutes, should I need to. Mind you, I do still struggle to understand the need for the rice and pasta to be 'boil in the bag' unless you don't own a seive or a colander... it means I can't test the food to see if it's ready and I also don't like being TOLD how much pasta or rice constitutes a 'nutritious' meal because every child's appetite and requirements are different. The pasta pieces are a bit small for Lara now but would be good for a smaller baby. 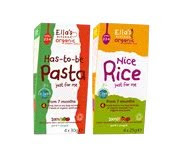 One of Ella's Kitchen's plus points for me is their website – they have some great baby and toddler recipes, many of which have absolutely nothing to do with their range of products; they are just healthy, easy to make foods ideas for children. Another plus point is that Ella's Kitchen have a partnership with Terracycle to encourage mums and dads to 'upcycle' their used baby food pouches (the recent trend for which does my head in when I have my green hat on). You can read more on their website.